March proved a pretty good month for NJ Horseplayer, garnering not just one, but two berths in the Simulcast Series Challenge Invitational on Saturday, April 20 at Monmouth Park. Results are pending Monmouth Park's audit, but yesterday I finished 8th out of a record-high 323 contestants in SSC#3, where the top 20 finishers round out a 60-entry field, with the top two players on April 20 advancing to the 2014 National Handicapping Championship in Las Vegas next January. Considering there are few local on-track NHC qualifying events, picking up a pair of spots in the SSC Invitational seems a coveted accomplishment in my third full season of competition, and getting to play two cards gives me a 1-in-30 shot at Vegas -- not bad, considering that over the course of the SSC qualifiers, there were some 900 entrants playing to make the final 60. I spent a good amount of time on Friday handicapping two of Saturday's contest tracks -- Aqueduct and Gulfstream Park; I left Tampa aside, considering the lack of quality (one one allowance race). I targeted 7 "must-play" races of 23 total, five that I classified as "maybes", and tossed the other dozen or so aside (Gulfstream's was a deep card, with 13 races on Florida Derby Day). However, three of my seven "best bets" scratched, prompting me to break from my strategy of limiting my number of intended plays to 10-12 bets and delving more deeply into my "maybe" races. I ended up making 18 overall (of 34 carded races), not sold on anything in particular and dabbling a lot on horses I thought at least had a shot at offering value. Unfortunately I rushed into Monmouth Park to bet Race 1 at Gulfstream, where a dud named Happy Fella dropped my $100 starting bankroll by $10. Another "must-bet", Race 1 at Aqueduct, proved a harbinger of my late-contest play, where I switched off a horse I liked a lot, Ambassador Bridge, but not at less than 2-to-1 (off a 9-to-2 morning line) and lost $10 more on a flat Troubleinrivercity. Deviating from my initial pick proved valuable in my third contest race, where I thought Summer Breezing was too huge an underlay off a 6-to-1 morning line in Race 3 from Gulfstream. Monument Hill looked like a much better value at 9-to-2, considering his turf record (5 wins and only 3 off-the-board finishes in 19 turf starts) and decent performance in mid-February off a 7-month layoff. A courageous stretch ride by Paco Lopez proved the difference in Monument Hill winning and padding my bankroll to $125. My next 6 plays proved fruitless, including a confident $20 win/$10 show wager on 26-to-1 Alcolite in Race 5 from Aqueduct (finished a game fourth); I stuck to my guns, singling out Alcolite as a horse with a puncher's chance in what I considered a lackluster field of state-bred optional claimers. With my bankroll down to $45 a little more than halfway into the contest card, Will Run for Beer seemed like a logical contender in Race 7 from Tampa, the aforementioned allowance race at a mile and a sixteenth on turf. Perhaps flawed, but I tend to throw class out the window at Tampa most of the time, and I was not turned off by the class jump for Will Run for Beer from the claiming ranks; the horse was fresh off an early-February turf win at Tampa and seemed logical, and jockey David Amiss is lightly-raced but sports a respectable record for 2013. Amiss guided Will Run for Beer to a nose victory, breathing life into my contest hopes with a $103 score and upping my bankroll to $138 -- not great, but positive territory after 10 wagers. With no great confidence in anything on the rest of the contest card, however, I dipped down into some "maybe" race plays and went 0-for-5 to drop my bankroll to $78. My fortunes changed in a major way in Race 10 from Aqueduct. I think every horseplayer has jockeys that make their skin crawl. For me, Joe Bravo never wins when NJ Horseplayer money is on the line, and somehow I have no luck anytime I bet on Joe Talamo. There a part of me that thinks jockeys like this get extra pleasure in the winner's circle when my money's not on them, knowing that my hard-earned money went out the window with them so often. Admit it, you've been there too. Then there's Pierre Tomas, not to be confused with the New Orleans Saints running back, who in some years proved valuable to my fantasy football teams. Tomas, to me, is an automatic toss in any race. I have never really seen this jockey squeeze anything extraordinary out of a horse that, granted, probably has little chance of winning a race, but I've seen the likes of Eibar Coa, Maylan Studart and Vinnie Bednar score improbable victories on long-shots. Pierre Tomas... not so much, as borne out by Equibase data -- 4 wins in 170 starts. Race 10 at Aqueduct, a bottom-level state-bred claimer that drew a whopping 15 entries (four of whom scratched before the card and another that scratched at the gate), looked very playable to me, considering there was no clear favorite in a field better suited for hansom cab duty a few miles west in Central Park. That's a tremendous question, and one I could not come close to answering when my contest compatriot Terry Flanagan posed it to me yesterday afternoon. In hindsight, it turns out Christian Hidalgo rode long-shot Tactical Saenz to a runner-up finish in Race 1 from Aqueduct, and Equibase data show 3 wins, 4 seconds and 2 thirds in 55 starts...not awful for a 10-pound bug on a tough circuit. In any case, I thought the combination of these factors merited a $5 win-place stab (SSC contests mandate win-place-show wagers of at least $10 total) on Trixie Star, even with the odds escalating above 40-to-1 at the time of wager. Trixie Star broke very well from post 3, securing a place among the top two through a quarter-mile in 22.40 seconds and then getting into a speed duel with 3-to-1 co-second choice Ferritto; these two clicked off a half mile in 45.74 seconds, egregiously sharp for $16,000 maiden claimers. Neck and neck entering Aqueduct's final turn and into the stretch, Trixie Star scored a neck victory...at 76-to-1!!! The miraculous $513.75 score ran my bankroll to $581.75 at that point, good for a short-lived third-place. With only four races on the card, I knew I had a Top 20 finish and second berth in the SSC Invitational, but was insecure about my place in the standings, since several players behind me had $250-$400 bankrolls and could easily knock me down the standings, which happened over the next three races. Admittedly paralyzed by the unlikely victory at Aqueduct, I passed on Race 11 from Gulfstream, where on Friday I pegged 8-to-1 Upgrade as my top Gulfstream pick on the day, but he scratched, and I was not in love with any of the other runners in the Grade 3 Appleton. I then erred in passing on the Florida Derby as well, where I liked Orb but could not pull the trigger hovering around 5-to-2. So, heading into the final contest race, an allowance turf race from Gulfstream, I was in 5th or 6th place. 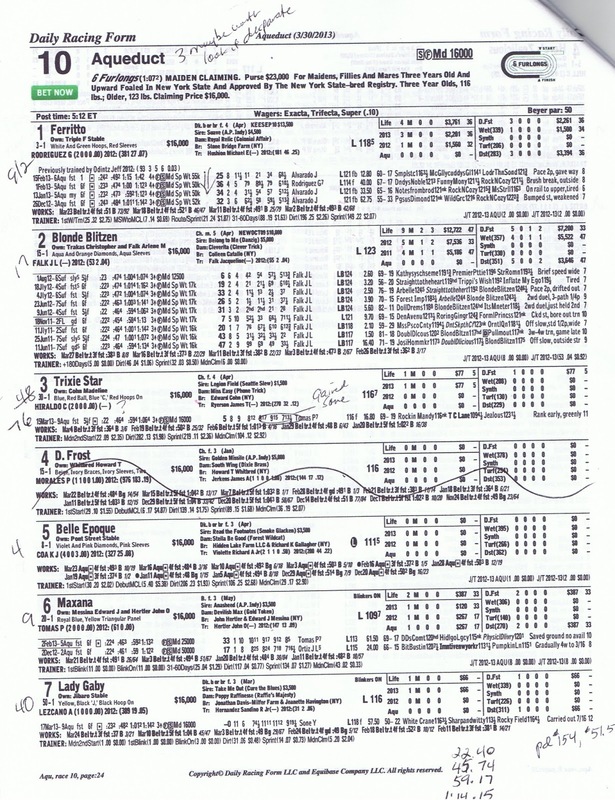 On Friday, I circled 6-to-1 Transgression as my top choice in Race 13, a $64,500 allowance. With 15 minutes to reconsider that choice, I erred in switching off to 5-to-2 Celestial Kitten, who was breaking from post 9 but, to me, seemed the class of the field. I figured I did not have a shot at taking down the entire contest (the leader was still over $2,200 at that point), and so I wagered $50 win-place, figuring I had a logical horse who could run my bankroll toward $700+ and perhaps grab a Top 5 placement and heftier prize money (fifth was worth $1,130). Celestial Kitten ran decently under Joe Rocco, but too wide into the final turn and flattened out to finish third behind, you guessed it...Transgression. Following the race, it was a matter of gauging the leaderboard to see where I finished -- 8th, ultimately, so clearly the final race gamble did not hurt me that much, considering 6th-10th place payouts were the same. I was $100 lighter, but in the end, satisfied with another Top 20 finish. I have yet to figure out how to handle two entries for the SSC Invitational on April 20, but I'll ponder that in the weeks to come. There are many players, I'm sure, that would like to have that dilemma, so for that I'm fortunate to have played pretty well in back-to-back contests and topped several classy handicappers. Furthermore, I also had another wonderful afternoon catching up with some great people on the contest circuit -- Jersey Capper Ray Wallin, Steve Fitzpatrick (who qualified for the SSC Invitational with a Top 20 finish in SSC#1), Paul Zerbst (NHC qualifier and SSC Invitational runner-up in 2011) and Mr. Flanagan. The shared passion of fellow handicapping contest players and the ability to tap their opinions and share some laughs and great discussion make SSC one of the best tournaments out there. Coming home a little richer as well certainly did not hurt matters either, so now I've got some extra powder to buy my two entries for April 20 and hope that my fortunes improve even more on my quest to qualify for NHC XV next January. Congrats on earning two entries into the finals. I normally don't play multiple entries but this past weekend I bought 2 in the Derby Wars Dubai qualifier for the $25K contest later in the day and I also earned 2 in the Derby Wars/Fairgrounds Louisiana Derby Championship. My strategy was to pick logical horses on one entry and live price horses on the other. 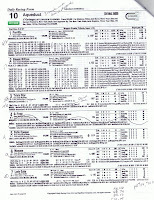 In the Dubai contest my logical horse entry finished in 2nd, which was good enough for a paid entry in the $25K contest. The other entry finished in 5th. In the DW/FG contest my logical horse entry finished in 2nd and the other finished in 4th. I did deviate a bit in this one because my logical entry was down in the high teens with 2 races to go. In the 2nd to last race I really liked a first time starter and used that horse on the other entry, which at the time was in 2nd and picked another firster on the entry that was pretty far behind. The 23/1 firster won and boosted my logical entry into second and the other stayed in 4th, which is where they ended up. To sum it up I had good success by playing normally on one entry and taking shots on the other. I kept the strategy the same until late in the day because I didn't want to start mixing and matching top plays with long shot plays. Doing that would surely result in a catastrophe and undue headache from over thinking the game plan. Hope this helps and good luck in the finals. Congrats Bill! I noticed your name on the leader board late in the day and was pulling for ya. In the 10th race at AQU I actually used Pierre Tomas in the contest - figuring he had the choice of mounts. I considered the 3 for a moment, but ultimately thought Mr. Tomas knew more than me. It was an exciting finish as the 2 leaders were literally walking the last part of the race, while Pierre Tomas was deceptively "flying" at the end to just miss. Good hit! ..and good luck in the finals. "getting to play two cards gives me a 1-in-30 shot at Vegas"
Your math is fuzzy dude, 2 * (1/30) gives you a 1-in-15 chance!